We have a team of health care professionals working collaboratively to help you achieve your optimum wellness potential. From Chiropractic, Physiotherapy, Dietetics, Occupational Therapy, Remedial Massage, Naturopathy, Yoga and Reflexology, our team and range of services will have you feeling great every day so you can enjoy life more fully. Thrive Wellness Centre is dedicated to helping you achieve long term health and wellbeing by providing specially trained practitioners who are up to date with the latest techniques and knowledge in holistic care. Our team are regularly up-skilling and training to ensure our clients receive the very best in health care. 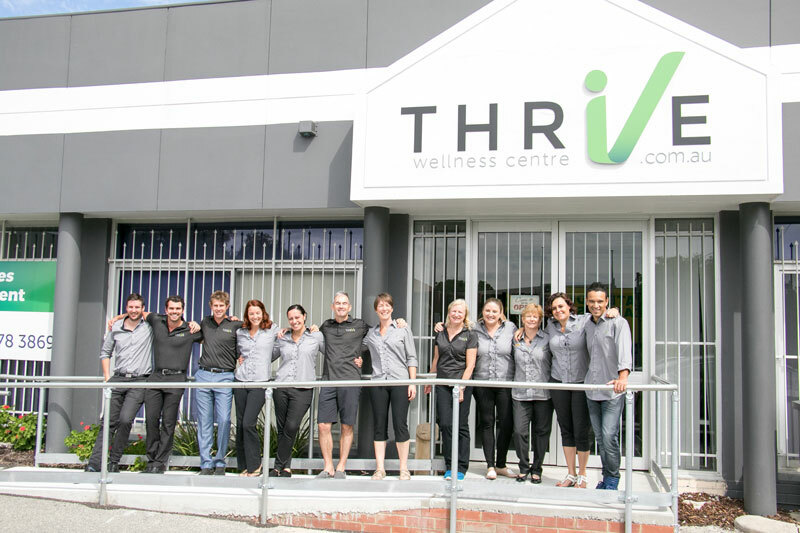 Thrive Wellness Centre evolved into an integrated health care centre from a background of pain management, chiropractic and remedial treatments led by owner Bryan Carver at a small centre based in Belmont. The desire to provide an even greater spectrum of services to enable individuals to reach their optimum wellness potential was the catalyst for bringing together some of Perth’s finest health practitioners. As the largest centre of its kind in WA , you can be assured, Thrive takes the confusion out of seeing different specialists whilst your on your health journey.